Afternoon Electives are an opportunity for students at GYV to try something new and spend time with their friends form all over the world. During Session 2, teens from Saudi Arabia, Libya, Jordan, Egypt, Japan and the United States enjoyed a variety of activities. 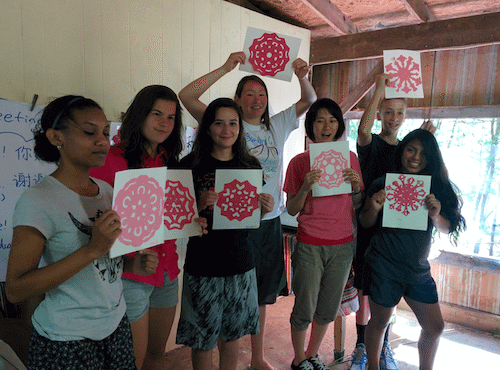 Students chose between Tile Painting, Dance and Chinese Language & Culture. In Tile Painting, students browsed through traditional tile designs from the Middle East, India and Europe. 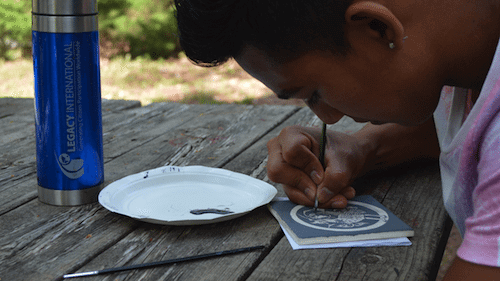 After selecting a design, students stenciled their tiles, painted the design and will shortly fire their creations in the GYV kiln. Jose Chi, from Mexico, particularly enjoyed the opportunity to tap into his creative side. 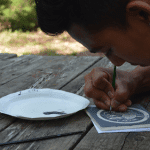 Jose, from Mexico, works on painting his tile during afternoon elective time. Across campus, boys and girls alike learned Ballet, Salsa and K-pop dancing in the Dance! Dance! elective. 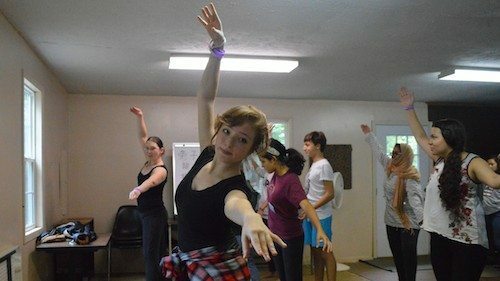 Laura Carroll, special program coordinator, taught the group basic and intermediate ballet choreography, including plie’, saute’, and various jumps. Saja, from Libya was surprised by how difficulty ballet really is: “I thought it was just people jumping around looking pretty, but its hard!” Ballet was followed by lesson on salsa dancing from Colombian native Maria and K-Pop (that’s Korean Pop) dancing, which Sara, from Saudi Arabia is a big fan of! “Ni Hao!” and “Xiexie” could be heard from the Art Studio, as students practice Chinese language, created traditional red paper cuttings and learned Chinese calligraphy. Native English speakers and ESL students alike were on level-playing field, as everyone learned Chinese for the first time! Students choose new electives every three days, so stayed tuned for updated about Kitchen Craft, where students will help Chef Ron in the kitchen; GYV Journalism, where students will create their own newspaper; and Spanish Language and Culture, complete with cooking Colombia arepas! What electives would you take at GYV? What electives would you like to see offered in the future?